When I ask a friend, “Have you been to McKinley Hill?” I often get the answer, “Uhm… no. How do you go there?” Haha. Well, there are vans near the MRT-Ayala Station (SM Makati Side) that costs P25 going to McKinley Hill and vice-versa. McKinley Hill is in Taguig City; mostly known for its Megaworld condominiums, embassies, football field – Emperador Stadium, international schools and office buildings. But what most don’t know, is that the community also boasts a restaurant strip that serve an impressive array of foreign cuisine. These restaurants are really a must-try! Formerly known as “The Burgery” it is one of the most affordable eats at posh Tuscany. The menu mostly consists of Western food favorites. 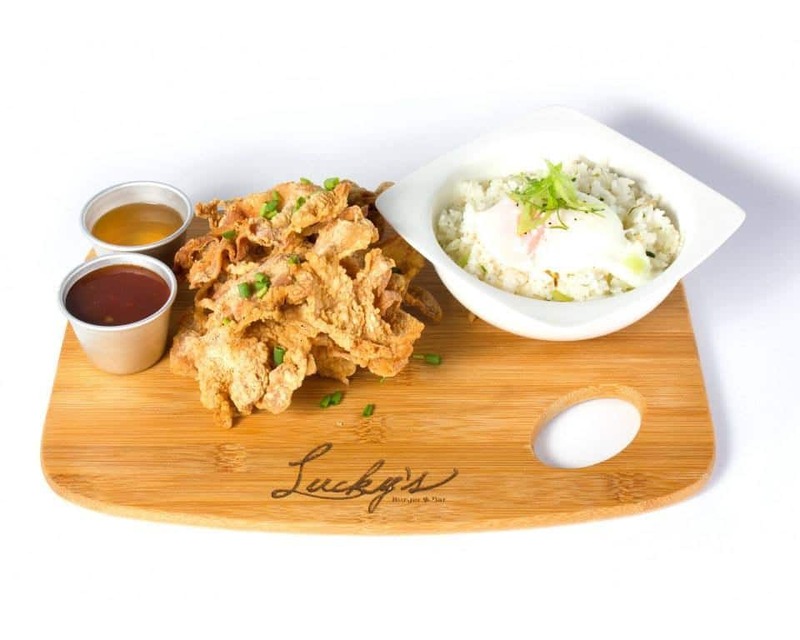 I recommend Lucky’s Crispy Bacon and Egg. It’s like a Baconsilog with a twist! This place has more of Canadian comfort food and has a vintage feel. They have their signature cup of happiness ice cream which comes in eight flavors, (P95/cup)! Great place to chill with your friends, may it be noon or night. Try their best-seller Poutine and Buttermilk Chicken (you might also want to order and add a glass of beer to that) Enjoy! Wursty-Wursty is worth the price and I must say, has a unique name. If you are in the McKinley area, you might want to check out this place. This is the best place to have some fun especially on a Friday night – grab some beer with your friends, jam with the band and eat a variety of finger food! You can buy a whole liter of draft beer that will last you the whole night for just P200. Not bad, right? If you’re after some Filipino cuisine, then go here. They serve some of the best and classic Filipino favorites – fresh lumpiang ubod, sizzling bangus, etc. Don’t forget to leave some space for dessert because they also serve homemade ice cream and halu-halo! Craving for some ramen? Japanese cuisine is also in Tuscany! This restaurant is one of popular place to eat ramen. A newly-opened modern sushi house at Tuscany, they offer fresh and authentic Japanese delicacies that are prepared in the traditional Japanese cooking way. It has two floors: first floor has the sushi bar and the second floor is for private dining. Outside of the restaurant are some Cherry Blossom decors. An American–Italian inspired restaurant. I had a really good first impression of the place as it was well-styled and is sophisticated. For pizza lovers, try their West Side Four Seasons Pizza! Fire Sword Cafe: Come for the food. Stay for the games.